D.O.T. ComplianceHighway rated trailer with 1/2 ton suspension. Electrical Brake and signal lights plus trailer wiring harness installed. Cart Body 18 Gauge Stainless Steel. Security Brass vibration proof cam locks. Fresh Water Tank 5 gallons. Waste Water Tank 7 gallons. Cooler Storage Insulated top entry ice box for up to 65 sodas plus meat. Dry Storage Top side display area plus additional under counter dry storage. PropaneTank 2 x 20 lb Tank Baskets. Gas Regulator Two stage regulator. Burner 17,000 B.T.U burner with adjustable control. Food Equipment Summary Triple Steamers. Additional Standard Features Hot and Cold Running Water. 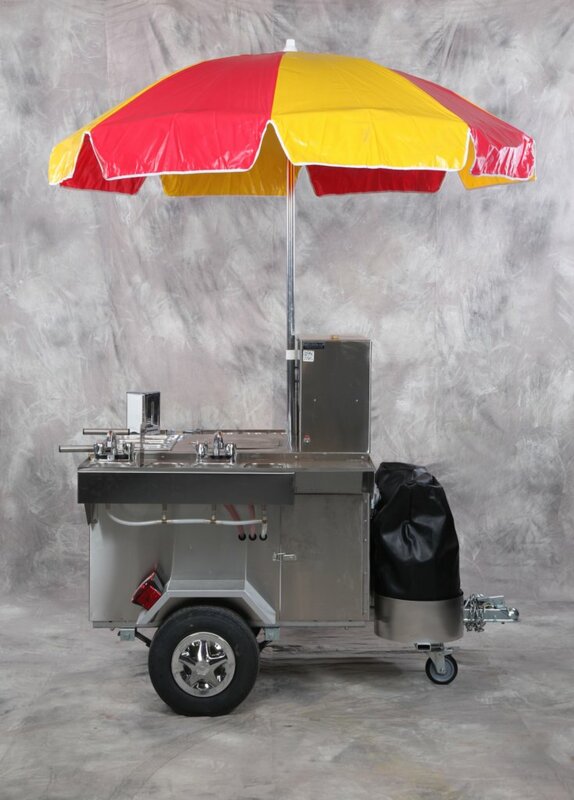 Additional Equipment Options Barbeque, Additional Sinks up to 4, Dual Propane Tank Baskets. See the Accessories pages for a complete list of optional equipment.